One of the most common reasons why a mortgage doesn’t actually close has do with the appraised value, and more specifically, a low appraisal. One of the three C’s of underwriting is collateral, which in the case of real estate is the value of the subject property and the corresponding down payment. Banks and lenders need to know a property’s worth to determine how much they are willing to lend to the borrower. Unfortunately, what someone is willing to pay for a property doesn’t always line up with what the appraiser thinks the property is worth. In most cases, the appraised value falls short of the purchase price because buyers often “overpay” to land the home of their dreams. Whether it’s really overpaying when someone is willing to pay for it is a question for another day. Anyway, let’s consider a common scenario. Say a buyer agrees to pay $525,000 for a home and seeks out mortgage financing for 80% of the value. They’d need a loan for $420,000 to stay at 80% LTV, which incidentally allows them to avoid PMI and perhaps obtain a more favorable interest rate. A 20% down payment means less risk to the lender issuing the mortgage because the borrower has skin in the game. 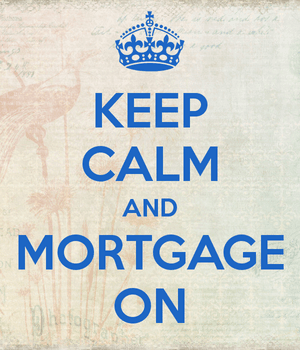 This means they can forego PMI and obtain a more competitive mortgage rate. Now let’s assume the appraiser comes back with some bad news. The home is only worth $500,000, and the bank is sticking to that valuation. The buyer either has to come up with more down payment money, get financing at a higher LTV (now 84%), or renegotiate the deal with the seller. Or walk away from the deal. Apparently, in many of these low-appraisal situations the buyers do just that, walk away. It might be by choice, it might be out of necessity. After all, not everyone has another several thousand dollars to put down if things don’t line up perfectly. 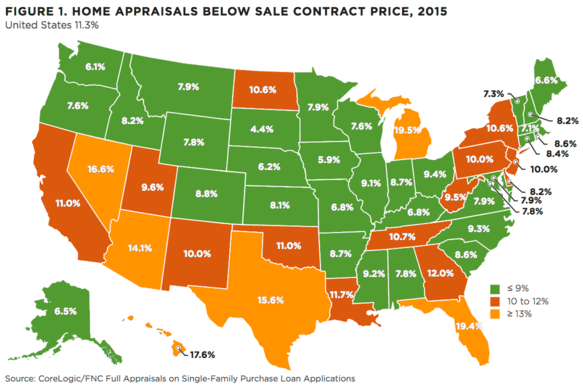 The frequency of low appraisals depends a lot of where it is you’re buying, as there appears to be quite a range geographically. In 2015, 11.3% of appraisals on single-family homes across the nation came in below the sale contract price (only purchases, not refis), this based on data from CoreLogic and FNC Solutions, a collateral information company. But some states had much higher instances of low appraisals, including Michigan and Florida, with rates of 19.5% and 19.4%, respectively. Other hot spots included Hawaii (17.6%), Nevada (16.6%), and Texas (15.6%). Meanwhile, low appraisals were only tied in 4.4% of home sales in South Dakota, 5.9% in Iowa, and 6.1% in Washington state. They were also uncommon in Nebraska (6.2%) and Alaska (6.5%). CoreLogic pointed to sales volume, market distress, and home price growth. It might also have something to do with the crisis and subsequent recovery. In many of the hot spots, home prices surged, came crashing down, and then recovered pretty strongly in a short period of time. While many states haven’t fully recovered, home prices have shot up tremendously since 2012, which often makes it more difficult to appraise the associated properties. Appraisers are at the mercy of the comparable sales in a subject property’s given area, and if the market is moving super-fast, it’s difficult to assign an accurate value that reflects the rising market, without being too generous. One could also argue that appraising homes has become a bit more conservative in light of the crisis, which was partially blamed on overinflated appraisals. In states where home prices haven’t seen massive price movements, it’s perhaps easier to assign values that match up with asking prices. This is especially true when there isn’t a bidding war that drives the price well above asking. The takeaway, for a buyer, is to understand the risk of a low appraisal when relying upon mortgage financing, and taking proactive steps so you can resolve it if it happens to you. Also knowing where it’s likely to be more common, especially when overpaying for a property. The seller might want to know the buyer has excess reserves in case it doesn’t come in at value, so the sale doesn’t fall apart. While low appraisals are certainly a common problem, they pale in comparison to loan denials for things like credit history and income issues (DTI), which are much more likely to sink a loan application.